This is pretty much summer on a platter! 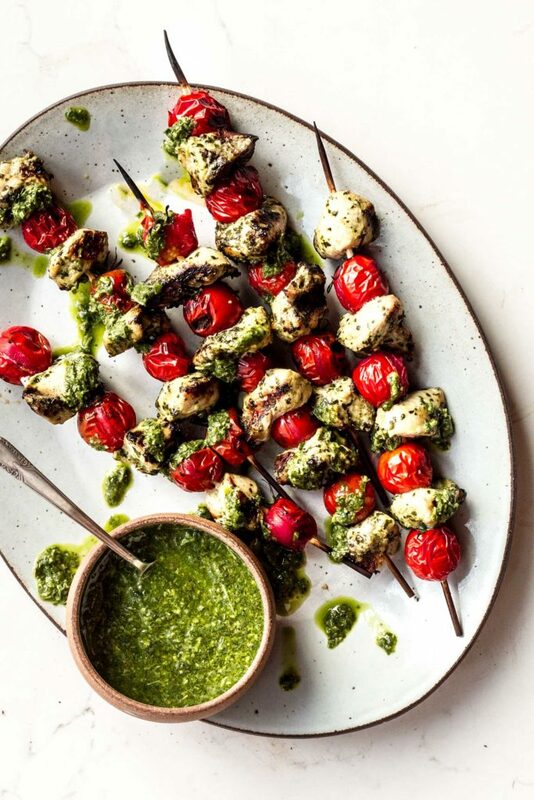 Grilled chicken and cherry tomato kebabs with basil vinaigrette. Simple, flavorful and perfect for a quick weeknight meal. If you haven’t tried grilling your cherry tomatoes get on it! They’re exceptionally sweet with a lovely smokey flavor from the grill. We served our kebabs with grilled corn on the cob and a couple of cold beers for the ultimate summer meal. The basil vinaigrette is a new Tumbleweed Farm favorite and it’s all thanks to one of our lovely CSA members (hi Jodi!) for introducing it to us. We have literally been putting it on everything. Kebabs, scrambled eggs, salads, pasta, roasted potatoes, and even drizzled over a breakfast quiche. The original recipe is from David Lebovitz and I changed it a tiny bit to use what we had on hand. It’s delicious and I hope that even if you don’t make the kebabs (which you should because they’re amazing!) that you’ll still whip up a batch of the vinaigrette. It’ll help use up all that basil that’s flooding the farmers market and maybe even your CSA share if you’re a part of one. Cheers to the wonderful summer harvest everyone! Prepare the vinaigrette by placing all the ingredients into a food processor or blender and blending on high until smooth. If the dressing is too thick add a touch more water to thin as needed. Taste for seasonings and adjust as needed. Place the cubed chicken in a large plastic zip-lock bag along with half of the vinaigrette. Shake the bag a bit and place in the fridge for at least 1 hour to marinate (or overnight is even better). Heat an outdoor grill to medium high and grease the grates. Thread the chicken and cherry tomatoes, alternating between chicken and tomatoes onto the skewers. Grill, for about 3-4 minutes, flip the skewers and grill for an addition 2-3 minutes or until the chicken is cooked through and the tomatoes are lightly charred. Serve with the leftover vinaigrette and enjoy. I’ve been loving kebabs lately – love the way they look (so photogenic) and how healthy they can be! Chicken and tomato sounds delicious!